Austin Pets Alive! has saved over 11,000 neonatal kittens since 2009. In this part two-part presentation, we’ll cover how to start and build a bottle baby nursery, plus how to create a foster network for neonates. During the first hour, Casandra Mensing will share her experience running APA!’s Nursery, from its meager beginnings to the groundbreaking phenomenon that it is today. 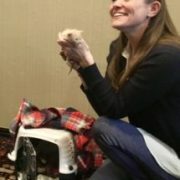 In the second hour, Jennifer Parks will focus In finding, training, and retaining specialized foster families for kittens, whether you have a nursery or not. This presentation will give you the tools to start saving kittens in your community today. Don’t miss finding out how we proved the experts wrong and surpassed a 90% survival rate!